"A copy of of Richardson's famous Shingle Style Stoughton house in Cambridge, Massachusetts, built fifteen years earlier, this house was moved in two pieces in 1950 from its original location at 66 Soldiers Place to its present location." "Another derivation [of H. H. Richardson in Buffalo] is the Coatsworth-Pardee-Wright house in Soldier's Place, which owes its wholly remarkable quality to the fact that the Buffalo architect Williams Lansing made what is practically a line-for-line copy of Richardson's finest wooden house, the Stoughton house in Cambridge." 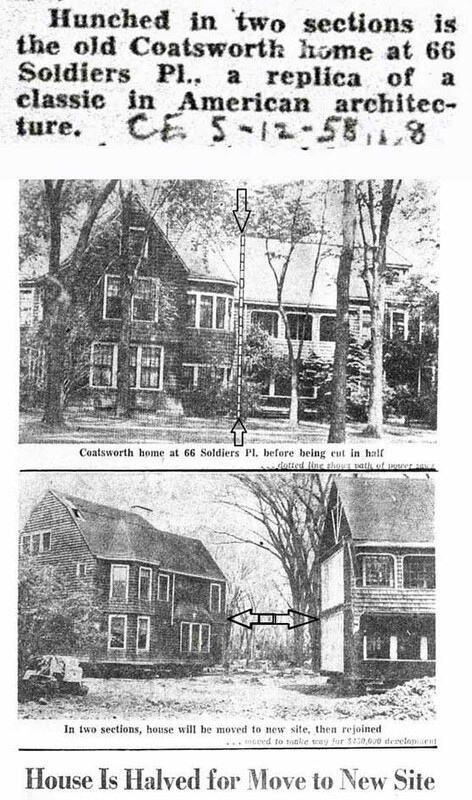 The image shows the Coatsworth House on Soldiers Circle in Buffalo in its original form and then cut in half as depicted in a 1954 Courier Express story. ... it was a close replica of a the H.H. Richardson designed stoughton house in Cambridge Massachusetts. The Coatsworth house originally sat directly on the circle but was moved back to the rear of the estate so that a set of small new houses could be constructed in its place. The paper indicates that the entire development project cost $450,000, a big sum back then. To move the quite large house, it had to be cut in half.